Clown mania is expected to be the top dress-up trend this Halloween as costumes continue to fly off the shelves at major retail stores and e-commerce sites. Masks and suits portraying creepy clowns like "American Horror Story"'s Twisty the Clown and Pennywise from the 2017 film "It" are expected to be seen this Oct. 31, along with some DIY makeup looks after "It"'s box office success. 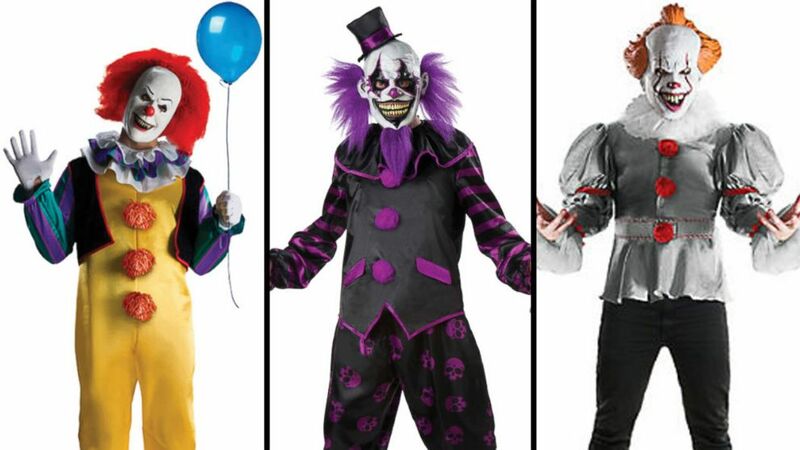 The "Pennywise The Dancing Clown" costume and the "Men's Bearded Clown" costume are available on halloweenexpress.com and the "Adult Gray Pennywise" costume from the 2017 film, "It" is listed for sale online at partycity.com. 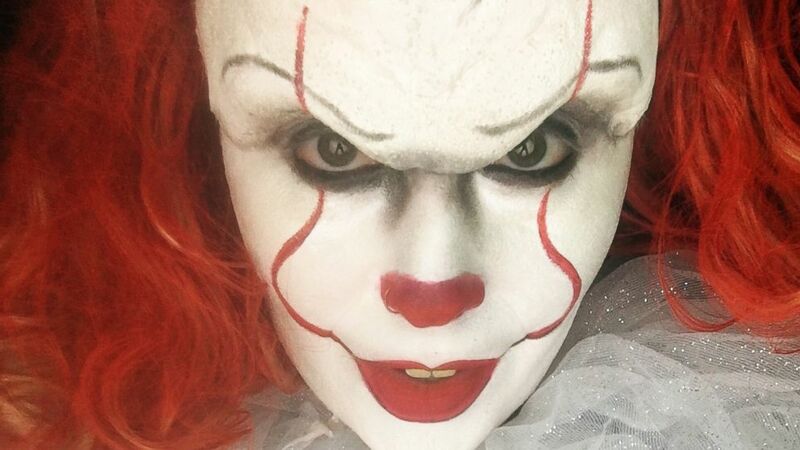 Gina Scheiber, 34, a full-time makeup artist from Sacramento, California, shared her scary clown makeup design on her Instagram when she portrayed a Pennywise look last month. Scheiber said she has seen many other makeup artists share the same design on the social media app. "I follow every makeup artist you can imagine and Pennywise has definitely been played out," she added. "I think with Halloween coming up [the movie 'It'] is definitely going to influence haunted houses and so will the creepiness of that makeup." Brad Butler, chief operating officer of HalloweenExpress.com, said their first shipment of Pennywise costumes and masks arrived in early September. "They sold out by the end of the month," Butler added. "Our retail stores however still have some inventory around the country. We are expecting to receive another shipment before Halloween." Both the mask and costume which portrays Pennywise from the original, 1990 film "It" are currently sold out on the company's website. Makeup artist Tonje Tiana Neteland of Norway shares her Halloween makeup design on Instagram for Pennywise the clown from the 2017 horror film, "It." Makeup artist Sabrina Ozuna of California shares her Halloween makeup design on Instagram for Pennywise the clown from the 2017 horror film, "It." Besides Pennywise, Butler said the "evil clown" costume and mask categories in general continue to be strong sellers for Halloween Express since 2016. "In fact, sales of this genre are up 21 percent from the same period a year ago," he said, adding that data or trends are preliminary and not everyone has purchased their costumes yet. "[D]uring the same period in which we sold out of the Pennywise merchandise, we sold nearly 7 times the amount of generic evil clown merchandise," Butler noted. Retail chain Party City offers an adult-sized Pennywise clown costume from the adaptation of "It." Makeup artist Jacquie Lantern of Minnesota shares her Halloween makeup design on Instagram for Pennywise the clown from the 2017 horror film, "It." 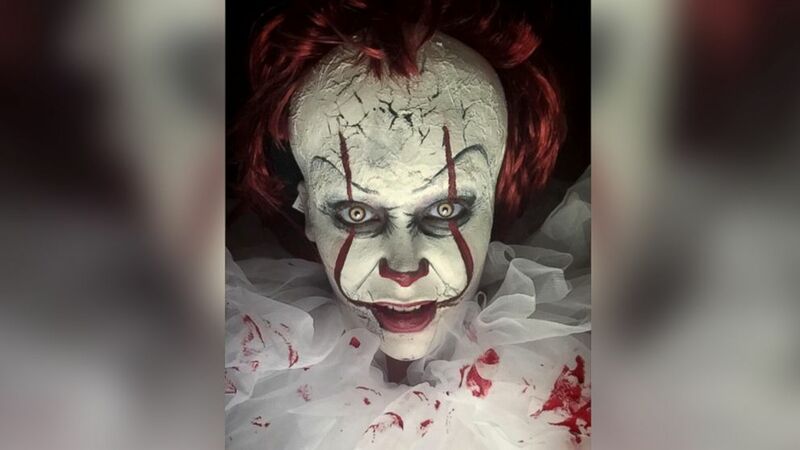 A spokesperson for the company told ABC News that "it's safe to say" that the "It" costumes are increasing in popularity this year because of the newly released movie. “Pennywise is one of the more popular items this season and is just another example of how our huge assortment makes it easy for customers to customize their costume and express themselves in a way that literally suits them best from head to toe," said Bill Furtkevic, vice president of marketing for Party City. Makeup artist Gina Scheiber of California shares her Halloween makeup design on Instagram for Pennywise the clown from the 2017 horror film, "It." 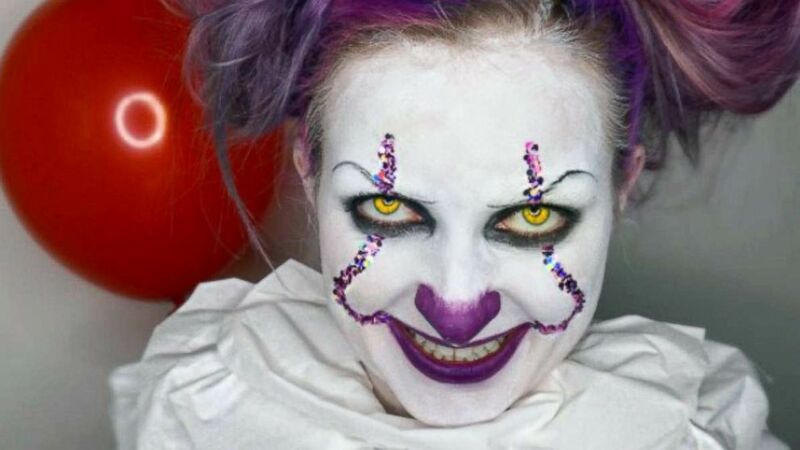 To achieve creepy clown makeup yourself this Halloween, here are Gina Scheiber's quick tips. Layer liquid latex and shredded tissue paper on top of the cap and around its edges to eliminate seams. Allow it to dry. Layer liquid latex on your forehead and areas of your face (Scheiber added some around her mouth), followed by shredded tissue paper on top. Repeat the process and let the mixture crinkle up on its own before fine-tuning with black liner. Apply white cream makeup to create the foundation for your look. Draw on eyebrows and add the color paint of your choice to the lips, nose and around the eyes. Scheiber used black under her eyes to appear scarier. Purchase a cheap wig and any additions that embody the clown character you are trying to achieve. For more application tips, Scheiber suggests exploring images from makeup artists and watching video tutorials online.